Rewarding Times are delighted to offer you this exclusvie deal with Botanic House. Botanic House reopened the end of July with a stunning refurbishment job. Completely refurbished and under new management. Their tag line is Classic Food & Drink with one side as a restaurant and the other side a more relaxed bar layout. They offer Early Bird and A la carte dining with weekend brunch. Really great seafood spot at the heart of Glasnevin with food served daily from 4 – 10pm. Your €100 voucher costing only €65 can be used for 2 diners against your food & drink bill in either the restaurant or the bar . Sunday afternoons - From 3.30pm there are easy listening tunes to add to the atmosphere. Full details of the entertainment line-up can be found at botanichouse.ie/news. 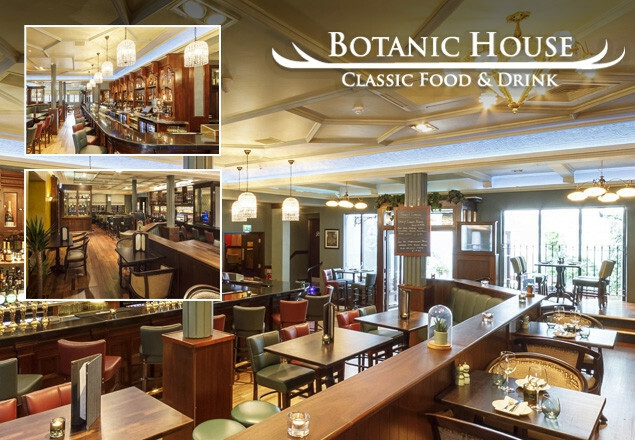 Botanic House itself is a listed building, with the refurbishment the owners wanted to culminate all the warmth and comfort of a traditional Irish hostelry with some Victorian features. The end result is classy but comfortable. You are guaranteed fine food, fine wine, tasty cocktails, a gin and whiskey corner with of course genuine Irish hospitality in this old but new Botanic House. Gratuity is not included in the price of the voucher. Voucher is non-transferable and is valid for one sitting only.